Sometimes I close camera and lens still open and sometimes it open AND close itself without touching the phone, any one support me to fix it? Also how I turn flash on while video recording? How I use flash in video recording in samsung s4 zoom? I dont have multi window. Does it because my version? Display size is nt good. goron, 21 Jun 2013so what no one want simbiyem anymore not even close just to call it a smartphone. i have nok... moreIf you can't spell "Symbian" you probably don't know how to use it ot what you can do with it (a lot). Likewise, you wouldn't know how to use this one either. AnonD-21645, 04 Jul 2013It's odd when people judge a phone immediately by how it looks... Have we come so far to only... morePeople just love to hate. Especially on Samsung lately. And picking on "plastic/thick" is one of their favorite targets. Have we come so far to only judge things on appearances?!? But remember the old HTC Tytan2's?!? And the phones with the slide out keyboards? And the SonyE P800 / P900s?!?! It's about functionality - the Samsung S4 Zoom is more than pocketable - it provides a brilliant halfway-house between camera / phone and something I wouldn't mind owning at all! I agree i think samsung HAVE TO BE FOCUS so that its resources will not be everywhere. For premium market just make galaxy note and galaxy note camera for a higher segment. Samsung scheming the market to much n makes its products floods the market. SAMSUNG BE FOCUS! Just make galaxy note,galaxy note full frame camera,galaxy note full frame interchangable lens with the most update 1080p n 800 snapdragon. Many people will not buy camera half sensor like that. 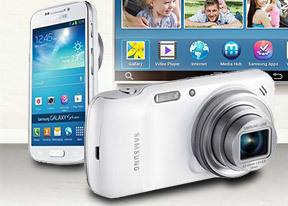 Look at your galaxy camera without call function or samoled it is saleable? Why people think that your camera is not as good as nikon or leica. With a 20x zoom on the galaxy camera, could someone clarify exactly why its worth upgrading to this one with a 10x zoom- is there anything specification wise that has been improved?